The Mercator Fellow of the SFB is Olivier Dudas. 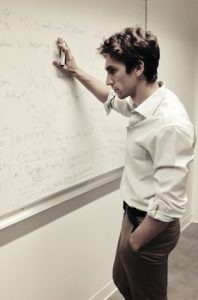 His research focuses on modular representation theory of finite reductive groups, with a particular interest in the geometric version of Broué’s abelian defect group conjecture. Olivier Dudas is currently a Chargé de Recherches (Research Fellow) at the CNRS, working at the Université Paris Diderot – Paris 7. Before that he was an EPSRC Postdoc in Oxford, as well as a Junior Research Fellow of Magdalen College, Oxford. He completed his Ph.D. in 2010 under the supervision of Cédric Bonnafé in Besançon. His current webpage can be found here. Olivier Dudas spends research visits at the main locations of the TRR on a regular basis.